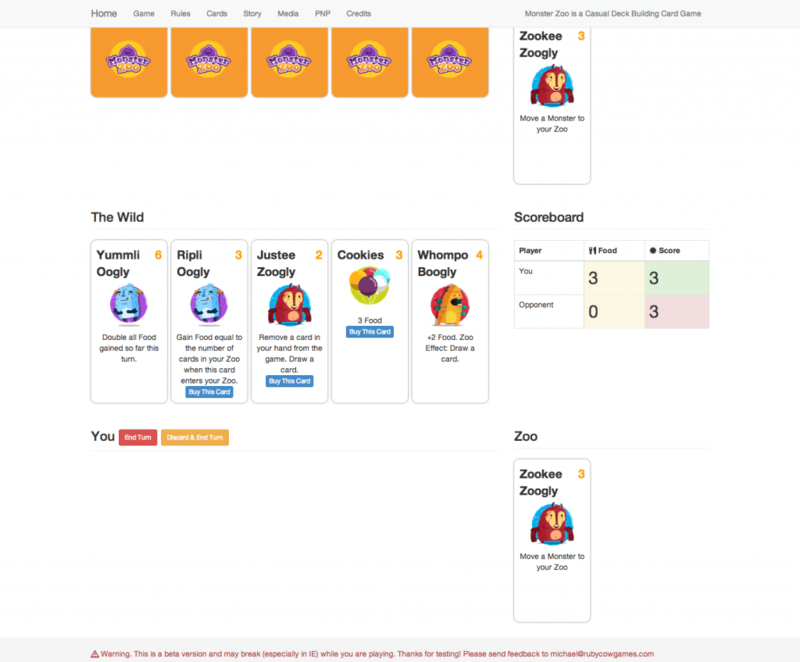 About a month ago, I started working on an online version of Monster Zoo to help with playtesting. My main reasoning behind creating an online version of the game was to get more feedback. I was finding it hard to get local playtesters and most playtesters get tired of playing every version of your game. Rapid Updates – I can easily change the value of a card and all playtesters will get that update next time they play. With the physical game, you would need to print new copies of the card and send the card to all your playtesters. Forced Blind Playtesting – Since the game is online, most of my playtests have been blind playtests. I can’t physically assist anyone or really explain the game outside of text chat. Less Local Restrictions – Last night I played a game with a player from Singapore (I’m in California). You aren’t limited to just your local area for playtesting. Heavy Initial Investment – I spent a good month learning how to program. That time could have been spent working on the game. My hope is that the feedback I get from the online game will make for a better game overall. Harder to Fix – It’s easy to “fix” a card in the physical world, you just take a pen and write on the card. But when code is involved, something that is broken could take a ton of effort to fix. Right now the game is only available to playtesters. If you’re interested in playing the game before everyone else, I’m looking for more playtesters. This entry was posted in Game Design, Monster Zoo on September 5, 2013 by Michael N..
What is the “core mechanic”? And what does it have to do with game design? The core mechanic of a game is the thing that players do over and over during a game. It’s the main action or the main task. Without the core mechanic, you wouldn’t be able to play the game. 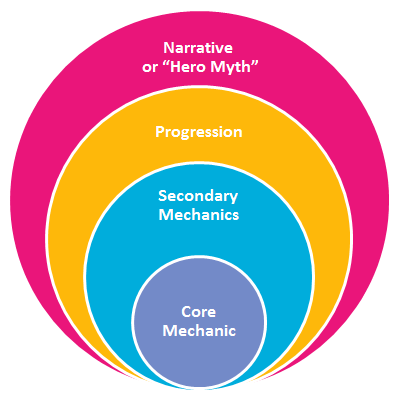 Many games are designed around one core mechanic and as the game progresses, you learn to do more and more complicated things related to the core mechanic. A good way to think of this is through the “core diagram” – a diagram created by Charmie @ Funstorm. In this model, the core mechanic is the center piece of your game. Everything revolves around this mechanic. Additional mechanics add upon the core mechanic for increased complexity. As you get better with the core mechanic, the game progresses to match your skill. Everything is then wrapped together with a narrative / theme. For example, this is the core diagram(s) for Monster Zoo. Since Monster Zoo is a deckbuilding game, one of the core mechanics is a very familiar one – playing cards. You essentially play cards to gain more cards, which then allows you to buy even stronger cards (progression). You’re doing all of this to build out your deck which will help you win the game. At the same time, there exists a second core mechanic – moving Monsters into your Zoo. 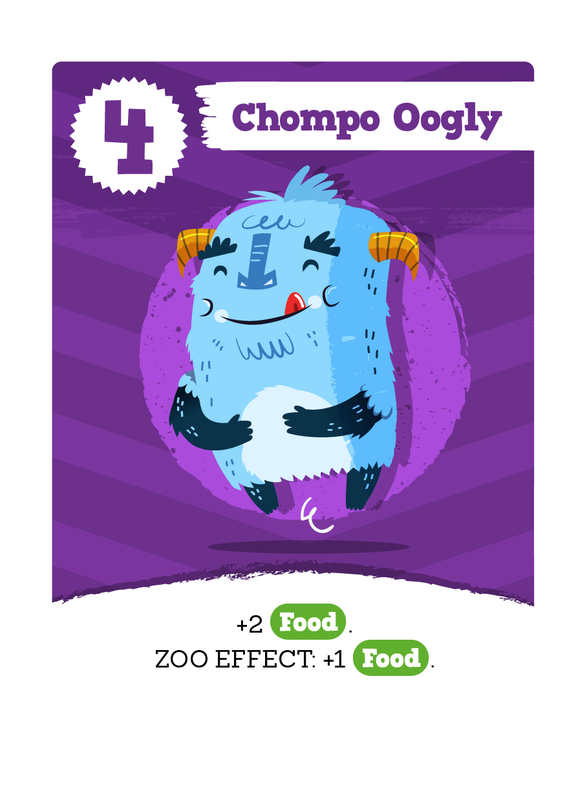 As you move Monsters into your Zoo, you earn points and possibly access more abilities/effects. These effects help you earn even more points by moving more Monsters into your Zoo. And you’re doing all of this to build your Zoo faster than your opponent to win the game. When I’m thinking of developing new cards for Monster Zoo, I try to refer back to this diagram and make sure the card is makes sense with the core game mechanic. Is this card in some way related to the core mechanic of moving Monsters or playing cards? If not, I’d better have a good reason for introducing a brand new core mechanic. That doesn’t mean there isn’t room to expand on a core mechanic, just that it’s useful to keep the core mechanic in mind during development. Chompo Oogly is a bit more complex. You can either play the card for 2 Food resources OR if it’s in your Zoo (and can’t be played normally) it will give you 1 Food every turn. So you have an interesting decision, that again lines up with both core mechanics of the game. Earning more food will help you buy more cards, which helps you play stronger cards later on. Moving Chompo into your Zoo will give you a reoccurring effect that provides a long-term benefit. What are some of the core mechanics and core diagrams of your games? 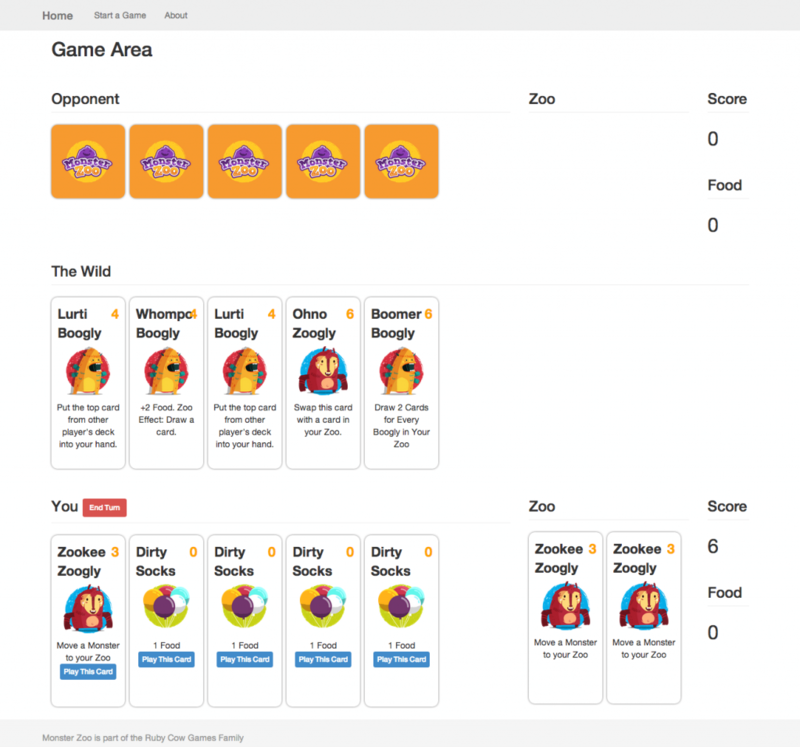 This entry was posted in Game Design, Monster Zoo on August 29, 2013 by Michael N..
Over the past few weeks, I’ve been feverishly playtesting Monster Zoo with a small handful of playtesters. The game is working well and the cards feel balanced. Feedback has been very positive and I’m happy with how the game is progressing. But it’s not quite ready for launch (on Kickstarter)! Before I release it, I need more playtesters to make sure the game is as awesome and fun as possible. 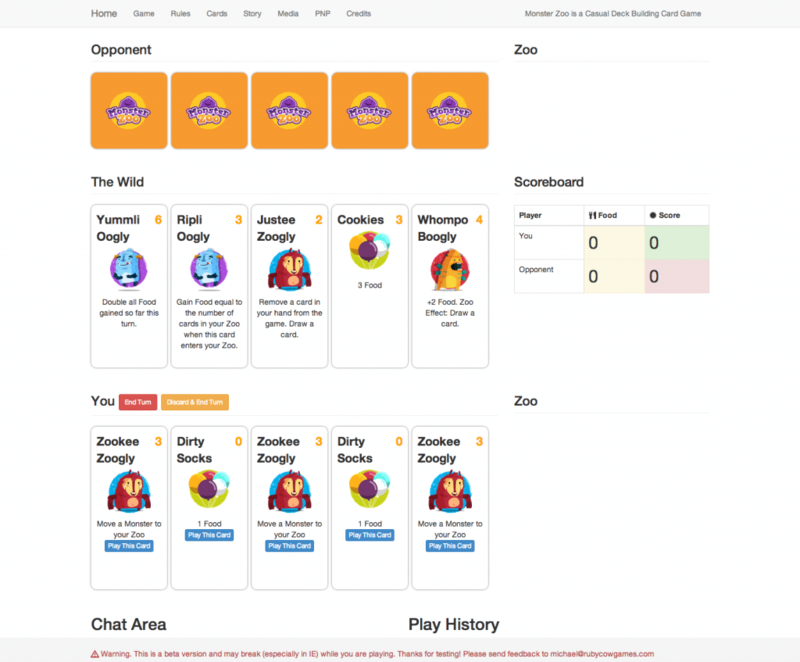 As a playtester, you’ll have direct influence on how Monster Zoo develops. Input from our playtesters is critical and I spend a lot of time incorporating playtesting feedback. In order to help out playtesting, I’ve developed an online version of Monster Zoo. 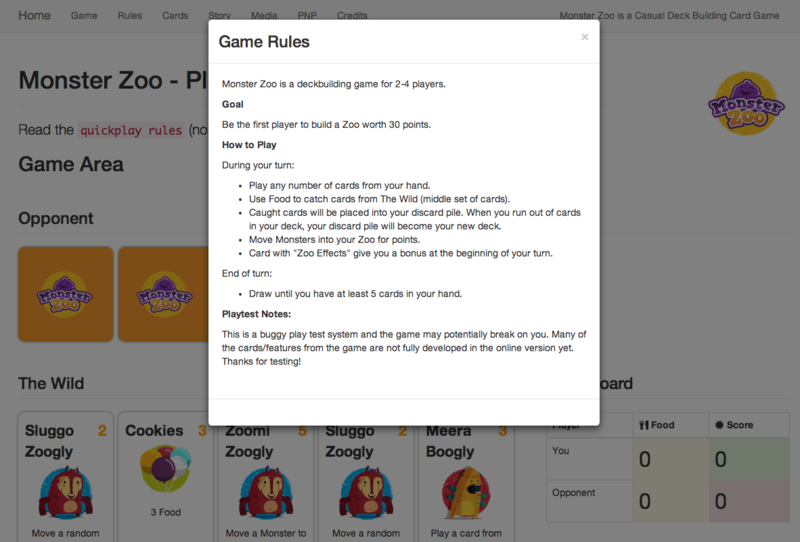 The online version is limited to just our playtesters, so you’ll be one of the first few to play Monster Zoo. Shoot me an email at michael@rubycowgames.com with the subject “Playtesting“. I’ll contact you back and get you setup. This entry was posted in Monster Zoo on August 27, 2013 by Michael N..
Time for another interview. This time around, I got to spend some time with Chris Green, designer of WarFields. 1) Please tell our readers a little bit about yourself. Sure thing. First I’d like to thank you Michael for giving me this opportunity to share with your readers about myself and my new game, WarFields. My background is in graphic and web design, but I’ve loved playing all kinds of games my entire life. When I started creating Minecraft adventure maps a couple years ago, there was something fascinating to me about creating an experience others could play and enjoy. I transferred that to table top games and created a simple adaptation to Chess. Instead of Checkmate being the goal, you had achievements you had to complete to win the game. I had so much fun making and play testing that game I kept going and made a totally different game, WarFields. 2) Can you describe WarFields in a few sentences? 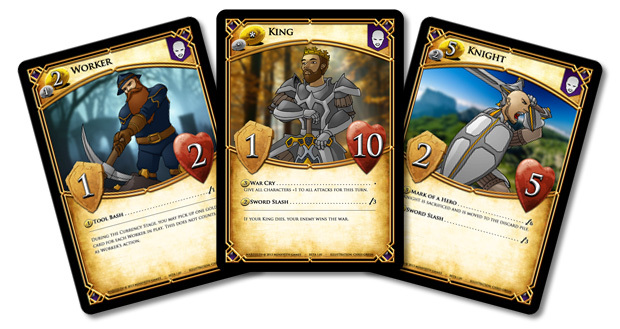 WarFields is a two player fantasy card game of warriors, summoners, beasts and undead. You’ll build an army of the unique characters and progress across fields to meet your opponent head on. Break down your opponent’s army and take down your opponent’s king before he takes out yours. My favorite mechanic of the game easily has to be the fielding. There are six fields in the game. There is a Kingdom Field for each player and then the other four are in between the two Kingdom Fields. Your characters start in your Kingdom and progress across the other fields to battle against your opponent. This is my favorite mechanic because the beginning fields are far away enough to allow each player time to build their army without being attack right away. This also eliminates the need for characters inability to attack when they are first played, “summoning sickness” as its called in some games. And still another reason is it allows for many modifications to happen within each field. 4) Tell us how you came up with the theme for WarFields. I’m a huge fan of all things fantasy, especially that of Lord of the Rings or The Elder Scrolls. So it’s no wonder that my first battle card game is set in this theme. With fantasy, the possibilities are endless. You can have simple sword fights between human warriors all the way to epic battles with dragons or gods. Races are vast and the mythical creatures at limitless. Abilities can physical or magical. With fantasy the doors are wide open to add any element to the game. Fantasy is not only one of my favorite themes, it is also a positive theme among most people who read fiction, go to movie, and play games. The last thing about fantasy is that it’s well established. People know what a Minotaur is without having to explain anything. They know what they look like and that they are physically tough. Same thing goes with Wizards, or Mages, or Archers. We know these character types and understand their strengths and weaknesses. 5) What’s your favorite Card in WarFields? My favorite card in the game is a tie between the summoners and the necromancers. The summoners allow you to play beast characters like a Lions and Trolls. Likewise the necromancers allow you to play undead characters like Skeletons and Ghosts. When you have a summoner and a necromancer, you open up the possibility to play twice as many characters than you would have if you didn’t. 6) What are some other games that if other players liked that game, that they would like WarFields? I think if you’ve played Magic and Dominion you would enjoy playing WarFields. Even games of other themes like Pokemon and Munchkins I think would also be good references. 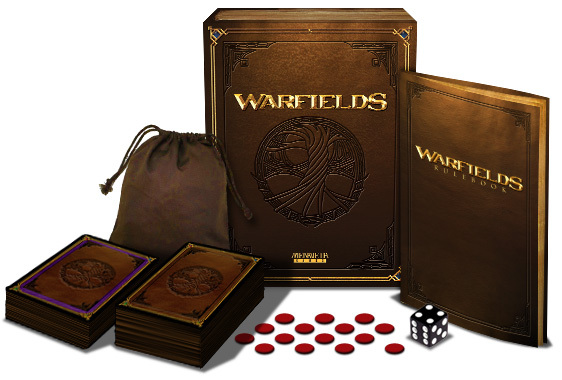 7) WarFields is your first Kickstarter table top game project. What are some of the things you’ve learned from this experience that you think other Kickstarter creaters would benefit from? I had a friend who had a Kickstarter, he had a great video, but only a paragraph of content underneath that. He didn’t have any updates nor do I think he tried to seek individuals that had larger audiences for publicity. Need less to say the magic of Kickstarter wasn’t enough. He got about 10% funded of only an $8000 goal. My recommendation is this: seek out credible and popular bloggers, podcasters, youtubers, related to the subject matter and have them review, preview, interview, yourself and your project. But don’t just shoot them an email, and definitely don’t shoot a mass email. I tend to ignore those because they are impersonal. Engage with the person you are seeking help from. Read, listen, watch their posts and comment on these things. One last thing I will say about this is please don’t follow this word for word. For a while I took an example letter and changed it only slightly to fit those I contacted. After a short while it didn’t feel like a personal email, just a mass email that was copy/pasted a few extra times. To sum it up, start a fresh email every time, be genuinely interested in their posts, tell them about your Kickstarter, and thank them in the end. 8) What were your design inspirations for creating WarFields? I didn’t have many games to reference inspiration, all I had was the games I have played and what I thought would make a good game. Two examples I could talk about is the gold in the game and the fielding. Collecting of gold evolved a lot over the course of development. It started out as energy, but I was unsure how players would collect that energy. Not only that, but it felt too much like Mana or the Energy Cards in Pokemon. When I changed it from energy to gold, I had in mind a mine that workers were put in to collect the gold. But instead I left the workers in the combat fields to not only limit the number of workers someone might play, but to also put them in harms way, adding that extra bit of conflict. The fielding was actually designed so that characters could be played right away without having, like I said before, “summoning sickness.” After fielding was establish has a main mechanic to the game, a flood of ideas poured out of that. Not just melee and ranged attacks, but also teleporting, field bonuses, obstructions. So many ideas came that I wasn’t able to fit them all into the current version of WarFields. Rest assured, there will be expansions. 9) What type of gaming experience do you hope to create for the players of WarFields? My hope would be that players have a fun and challenging battle. It’s a game. It shouldn’t be taken too seriously. But I also don’t want players to give up without a fight. Even when the odds are against you, you never know if the dice will start rolling in your favor. And, as always, leave room for a rematch. 10) Anything else you would like to mention? If you like to check out the Kickstarter, you can go to the Kickstarter website (www.kickstarter.com) and search WarFields. If you want to visit our website, you can find it at: www.menaveth.com. Thanks for checking us out! Thanks for the interview Chris! Good luck with the upcoming Kickstarter campaign. Make sure you check out WarFields on Kickstarter later this month. This entry was posted in Game Design on August 26, 2013 by Michael N.. I recently got a chance to interview Beau Langston, designer of Domain: Lods of Ether, a game where players build the game world as they play. Really interesting! Let’s dive into the interview. I am Beau Langston from the company A Jolly Corpse. We are a small game development company based out of Denver, Colorado. I have been making independent games for almost 15 years now, and playing them for close to 25. I started with making video games, but my love for CCGs and TCGs inspired me to try my hand at one of my own. And the result is Domain! 2) Can you describe Domain: Lords of Ether in a few sentences? 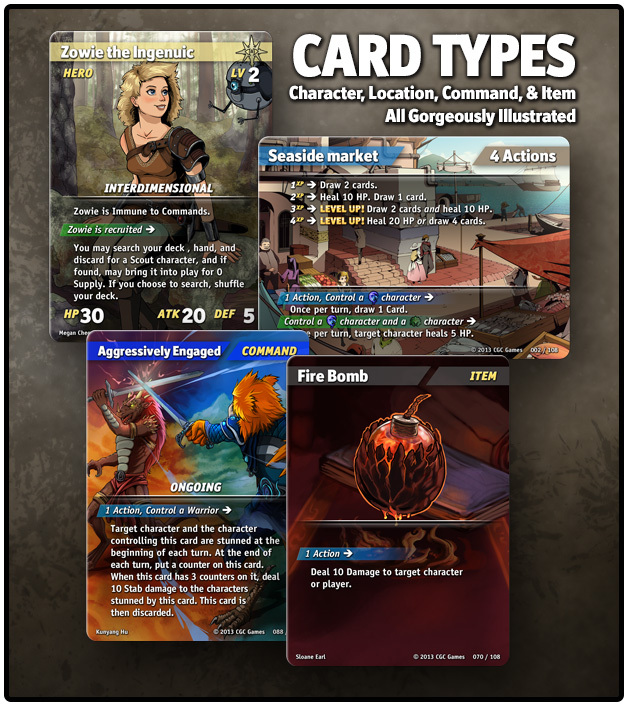 Domain is a TCG for 2-4 players, which focuses on a world building mechanic and simple combat outcomes. In a lot of ways, it’s more of a board game than it is a card game. Players build the game world and claim territories. As their territory expands, they gain more Ether, which they can use to summon stronger monsters or cast more powerful hexes. Each player is represented by a Lord, who has a set of abilities, which players can usually access once a turn. These are key to many victories. Battles were designed to be simple to execute, with a heavy emphasis on abilities and counter ability mechanisms. The game’s name itself comes from the 5 domains of the game world: Gloom, Faith, Order, Chaos, and Deception. By matching these together, monsters become more powerful! My favorite mechanic in the game is the world building and how it changes how each game feels. Some playthroughs, all players will have a lot of separation between them, allowing each player to form little bases. Other playthroughs, the game will be a complex network of inter-connecting paths, where retaining properties is a constant challenge, and a lot more hex-play comes into effect to try to keep your opponents at bay. We were sure to include a lot of abilities and hexes which can alter the game world, so nothing is set in stone once laid. 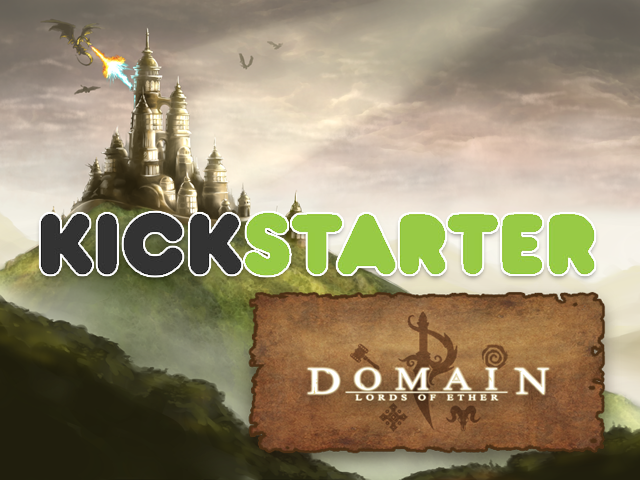 4) Tell us how you came up with the theme for Domain: Lords of Ether. Domain was developed through several iterations of trial and error. I came up with several premises and Jesse (my co-developer) would modify and improve upon the concept. Initially I wanted to do something that involved three groups of players–each with a unique goal, but this was turning out to be too complex for practical play, so we simplified some of the concepts and put more emphasis on the world building. 5) What’s your favorite Hex? I am a fan of the persistent hexes like “Land Sap”. When played on an opponent’s Soul Well, it prevents them from putting monster ether value over the Soul Well ether value. This results in crucial Soul Wells from having much in the way of defense. It’s also an expensive card to discard once played, so opponents have a tough choice ahead of them. 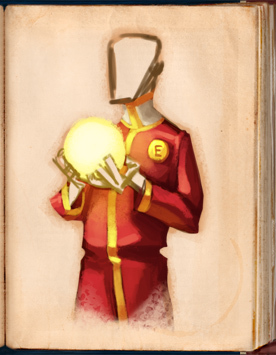 6) What are some other games that if other players liked that game, that they would like Domain: Lords of Ether? The best comparisons would be between Risk, Magic the Gathering, or Carcassonne. The path elements and defense tactics have more in common with board games, but the combat itself is very similar to Magic the Gathering. The combat was designed to be for more casual gamers, and to put the focus of the game on resource management and strategy. 7) Domain: Lords of Ether is your first Kickstarter board game project. What are some of the things you’ve learned from this experience that you think other Kickstarter creaters would benefit from? It is! And our largest recommendation so far would be to not rush anything. Kickstarter is a tough world and the best chance you have for survival is to be noticed and have a lot of hype going into your campaign. A majority of your pledges at first are going to be from the Kickstarter webpage itself. So having a lot of support from the community to survive those middle weeks is crucial! A well developed kickstarter page can land you on the staff picks, which is where you’ll want to be! 8) What were your design inspirations for creating Domain: Lords of Ether? Originally the design inspiration came from the desire to create a dungeon crawler and overworld-like RPG experience in the form of a board game. When there were going to be 3 players, one of them would be a dungeon master, and build the overworld for the players. But when this was determined to be too complex, we gave this power to the players. Combat was much more complex at one point, but it was difficult to keep track of the amount of combat that could potentially arise, especially with the number of battles and hexes occurring. So stream-lining everything helped a lot. 9) What type of gaming experience do you hope to create for the players of Domain: Lords of Ether? We would like to have a good sense of community and rivalry while the game commences. The frantic rush for the first available Soul Wells and the mounting of forces leading up to the final crucial battles. There are great Sieges, petty feuds and baiting tactics. The overworld creates a lot of choices, and the resource management means no one is out of the game for long. Even if things look dire, a good draw or clever play can change everything! Thanks for the interview Beau! Make sure you check out Domain: Lords of Ether on Kickstarter now. This entry was posted in Game Design on June 24, 2013 by Michael N.. I recently got a chance to interview Alistair Wong, designer of Wordsmith, a fast-paced party card game that tests your speed and vocabulary. Let’s jump to the interview. Hi, my name is Alistair. I grew up playing board games with my family and video games with my brothers. During high school, I’d spend my weekends and afternoons making small prototypes and playtesting. I then took a game design class in college that introduced me to the origins of revolutionary games contributing to the gaming landscape we know today. It was by far one of my favorite courses. Now that I’m finally a bit older, I decided to get past prototyping and try completing a full game. I currently manage a small team in the software industry in sunny San Diego California. I enjoy practicing martial arts, drinking expensive ( but not paying for ) craft beer. I’m a big fan of IPAs for their strong hoppy tastes. My most recent game I played is Munchkin. It’s silly fun, but does take a while to get to Level 9. 2) Can you describe WordSmith in a few sentences? WordSmith is a fast-paced card game that’s great for parties. You race against your opponents to build words using cards with two letter combinations. Once the game starts, it’s pretty much a free-for-all that tests both your reaction speed and your vocabulary. It’s not explicitly stated, but you don’t have to draw a new card right after you make a word. This allows a player to “chain” their hand and play multiple words at once before drawing. That way you can potentially monopolize the field during the downtime when other players are drawing and studying their new cards. 4) Tell us how you came up with the concept for WordSmith. For WordSmith, I wanted to make a word game that was multiplayer and fast paced. Word games don’t really need any pictures, which is great for me since I’m terrible at drawing. I had also played with the idea of calling the game WordSoup, using noodle-shaped letters and a tomato soup background. 5) What’s your favorite Card in WordSmith? XY — It’s very XY. This card was recently added to complete the inclusion of the full alphabet in the WordSmith deck. It’s worth 5 points, colored purple, and can only be used in a handful of words. Claiming that card during gameplay gives your score a huge boost. 6) What are some other games that if other players liked that game, that they would like WordSmith? 7) WordSmith is your first Kickstarter board game project. What are some of the things you’ve learned from this experience that you think other Kickstarter creaters would benefit from? I agree what a lot of people say, in that you should take your time and plan out your campaign carefully. If I could redo this, I’d make a more concrete marketing plan and promote the game BEFORE launching. It helps to have a cult following for that initial funding bump when you first launch your kickstarter campaign. I find myself playing catch-up and getting reviews and demos set up after the launch. Having to do all that with the Kickstarter deadline drawing nearer each day makes for a very stressful process. I feel like I’m treading water as opposed to riding the rollercoaster. 8) What were your design inspirations for creating WordSmith? One guiding principle that led me to design WordSmith was someone’s analysis on Settlers of Catan. The writer emphasized the importance of engaging players throughout the entire game. In Catan players receive Resource Cards even when they aren’t rolling the dice. The takeaway point is to keep all players some form playing and not waiting. Which eventually led to making WordSmith. 9) What type of gaming experience do you hope to create for the players of WordSmith? I’m hoping to create a light and fun atmosphere, but with an edge of competition. Losing isn’t too bad since the games are short and rematches will be aplenty. Since it’s a party game, I imagine WordSmith being played by families and groups of friends. I believe one of leading reasons to the new-found popularity of board games is the lack of human interaction and to get away from digital screens. You can stop reading now. A big thanks to my friends and family. These people are my anchors in the ocean. It’s them and their connections that really have given my campaign that extra push. Thanks for the interview Alistair! Make sure you check out Wordsmith on Kickstarter now. This entry was posted in Game Design on June 6, 2013 by Michael N..
Hi Michael, thanks for having us. My name is Justin Schaffer, and in February of 2013, my friend Robert Garza and I founded Terra Nova Games based out of Denver, CO and Austin, TX. Terra Nova Games was established as an outlet to share our passion for the hobby with others. Our goal is to encourage face-to-face fun through interactive and innovative gameplay. Guile is our own design and the first game we are publishing, and is launching on Kickstarter in June. 2) Can you describe Guile in a few sentences? 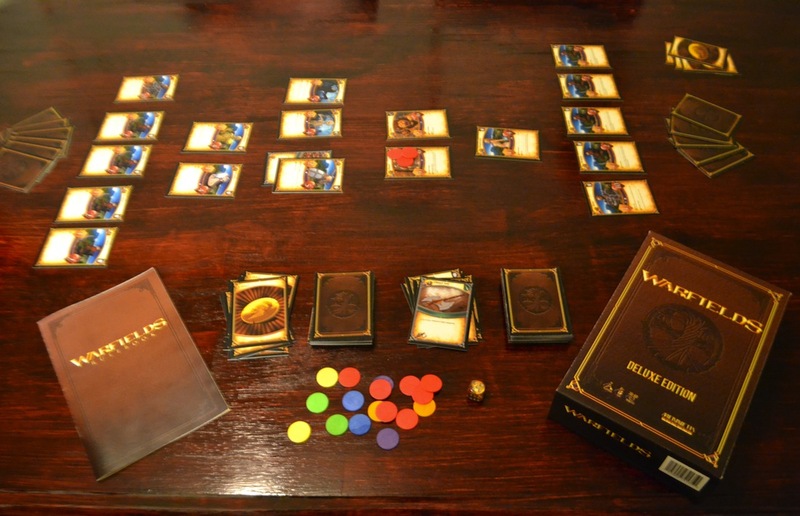 Guile is a 20 minute, medieval memory card game of deception and intrigue for 2 players. 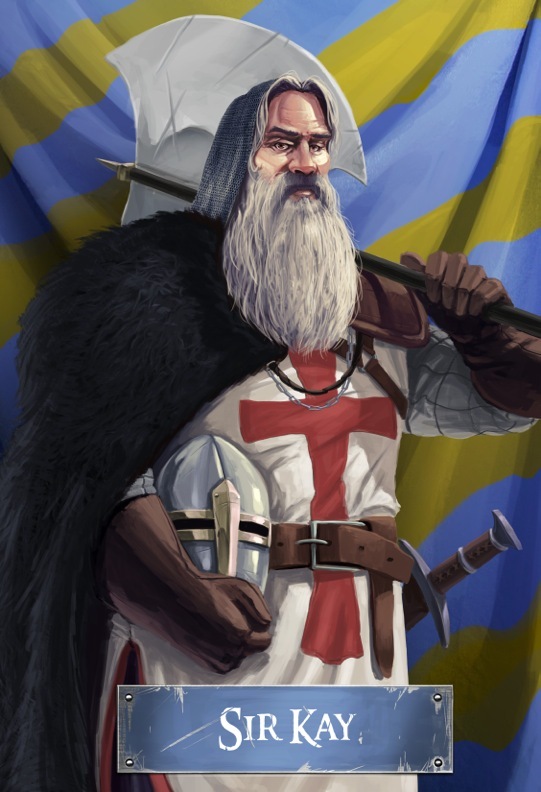 You are either the noble King Arthur or the nefarious Sir Mordred, and the Knights of the Round Table will be the instruments of your influence in Camelot. To win, you must trace the web of subterfuge and manipulate it to your own ends to wield the most influence when each Knight’s loyalties are revealed. Guile is primarily a game of memory, but there are some subtleties of bluffing and deception that create a slight meta game. There are moments when “Well I know, that he knows, that I know…” happens and is really fun to explore. 4) Tell us how you came up with the theme for Guile. Guile came together as a result of a game design contest where the component requirements for the contest were a maximum of 20 Poker cards and 10 cubes. The existing art of Kings, Queens, and Jacks from a standard deck of cards is where the medieval setting came from. Then once I created the circular setup of the cards, the gameplay lent itself to the theme of Arthur and Mordred and the Knights of the Round Table. 5) What are some other games that if other players liked that game, that they would like Guile? I have a tough time answering this question, and a lot of playtesting feedback has also not really been able to think of a comparable game. If I had to choose one though, I’d say Hanabi. Although Guile differs in overall feel, Hanabi also has a very simple ruleset and requires the same level of memorization that is needed to be successful in Guile. 6) Guile is your first Kickstarter board game project. What are some of the things you’ve learned from this experience that you think other Kickstarter creators would benefit from? 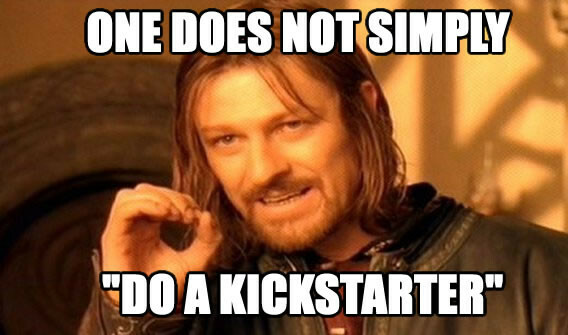 I recently saw this meme online that is a good testament of how not to perceive Kickstarter. Launching a Kickstarter is not easy. Several months of preparation and research need to go into your campaign. For the past 4 months we’ve been communicating daily with manufacturers, artists, distributors, composers, and reviewers all while trying to find the formula that results in a successful campaign. And that has been our most important discovery, there is no concrete formula that will guarantee a successful campaign. I’d recommend new Kickstarter creators check out this great series of Kickstarter lessons put together by Jamey Stegmaier of Stonemaier Games, but also be very involved with other projects and creators. So much can be learned by backing other projects and reaching out to other creators to see what has and hasn’t worked. The power of Kickstarter is not just in it’s platform, but in it’s community. Be yourself, be honest, be passionate. Love the community and they will love you back. 7) What were your design inspirations for creating Guile? Games teach in under 15 minutes, play in under 45, and beg for a rematch. Games are continuously strategic without being paralytic. Thinking will improve your chances of winning. Having a beer won’t hurt them…much. 8) What type of gaming experience do you hope to create for the players of Guile? Guile is quick to play with a simple ruleset and familiar theme which makes it approachable by casual and non-gamers. And since there is no luck involved, serious gamers could have Guile tournaments to prove who has honed their strategy best. Ultimately, we just want people to have fun playing our games. From what we’ve seen during playtesting, a lot of that fun occurs after the game when comparing and contrasting strategies with your opponent. 9) Anything else you would like to mention? Thanks again for taking the time to interview us. We’re thankful to be a part of such a supportive community. Terra Nova Games strives to bring people together in person, to use games as a means of socializing and strategizing around a table of friends. We’re really excited to release Guile on Kickstarter in June, and have plans for some great backer rewards such as a 4 song soundtrack and dinner/games with us at BGG Con. Thanks for the interview Justin! Be sure to follow Terra Nova Games and their upcoming Kickstarter for Guile on Facebook and Twitter. This entry was posted in Game Design on May 30, 2013 by Michael N.. This week, I get a chance to catch up with Jamey Stegmaier, founder of Stonemaier Games and designer of Euphoria – a cool worker placement game now on Kickstarter. Jamey has been publishing great content on how to run a great Kickstarter campaign over at his blog. He’s a great guy and I think just about everyone can learn something from his experiences. Hi, thanks for having me! I’m Jamey Stegmaier, the co-founder of Stonemaier Games in St. Louis with my friend Alan Stone. We founded the company thanks to a successful Kickstarter board game called Viticulture in the fall of 2012. I had designed games my entire life and decided to test the waters of Kickstarter with my latest game. Thanks to the support of 942 backers, we were able to publish the game and start the company! 2) Can you describe Euphoria in a few sentences? 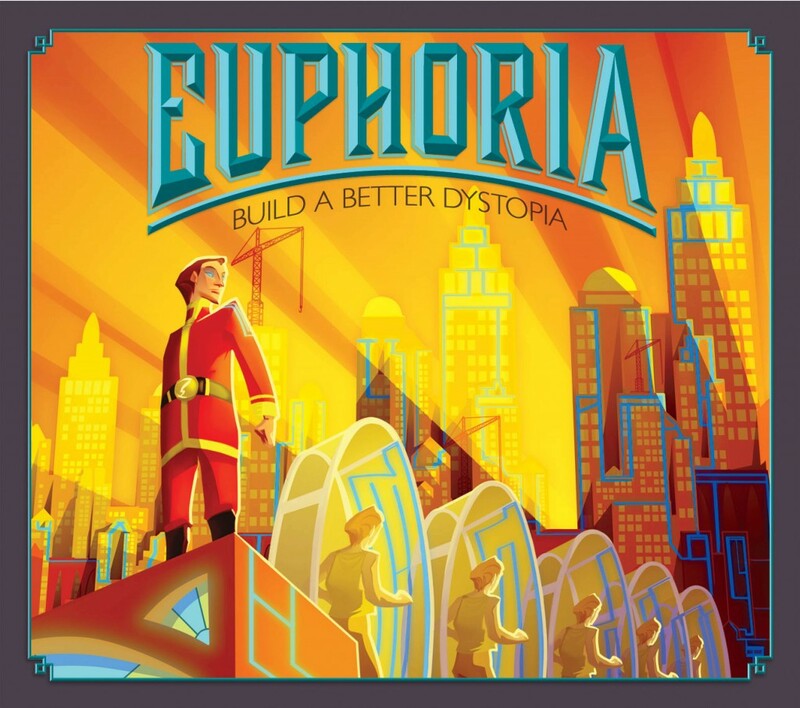 Euphoria is a dice worker-placement game set in a blissfully cheery dystopian world. By using elite recruits, emerging markets, ancient artifacts, and growing allegiances, players try to grab control before anyone else. This is tough, because there are a lot of new mechanics in Euphoria. But I think the most fun mechanic involves the market cards. At the beginning of the game, 6 random market cards are placed face-down across the board on construction sites. Players can work together or alone to build these markets. When a market is built, all players who didn’t build the market are faced with a new, ongoing restriction to the rules. This may sound painful, but it’s very gratifying for the players who built the markets, and it’s actually fun to try to work around the restrictions and adjust your strategy if you’re hit with them. You can also get out of those restrictions by doing certain things, but it’s difficult to do so. Also, once markets are built, any player can visit them to trade commodities, resources, and artifact cards for the ability to place ownership tokens (victory points). Each market has a different cost to visit, so every game is different in terms of what you need to acquire to move towards victory. 4) Tell us how you came up with the theme for Euphoria. Full credit to my business partner on this one. I wanted to name the game Dystopia for a long time, and I even got the permission of a video game company that uses the name for their game. However, Alan thought it was too gloomy, and he suggested the oxymoron Euphoria. The second he said it, I knew we had our name. 5) What’s your favorite Recruit? I had to pull up my PnP to answer this question. It’s tough, because there are currently 44 recruits in the game, and they’re all quite powerful. I’m going to have to go with the Futurist, just because I like the art so much. His ability is pretty good too. 6) What are some other games that if other players liked that game, that they would like Euphoria? 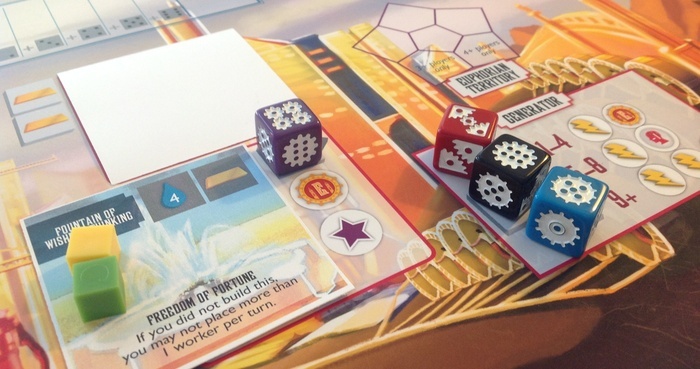 If you like the dice-as-workers element of Alien Frontiers and the place/retrieve choices in Tzolk’in and The Manhattan Project, you’ll enjoy Euphoria. 7) Euphoria is your second Kickstarter board game project and is already looking to be a huge success. What are some of the things you’ve learned from this experience that you think other Kickstarter creaters would benefit from? I write a series of “Kickstarter Lessons” over at www.stonemaiergames.com, and I can already tell that I have some additions to make to those lessons after Euphoria is over. I really think the key is to stay flexible and transparent during the project. There are going to be very vocal backers who don’t agree with the way you do things, and it’s easy to get defensive (in your head) and stop listening to them. But I’d recommend fighting that instinct as much as possible. Listen to them, show that you’ve listened, and stay flexible. That doesn’t mean that you have to change everything that a vocal minority says, but stay open to their ideas and consider polling all backers if you want a group consensus. Plus, that will make everyone feel more involved in the project. 8) What were your design inspirations for creating Euphoria? I think I have to give the most credit to Alien Frontiers—specifically, the flow of the game. There are no rounds in Alien Frontiers—you simply place your worker dice, leave them on the board, and when it gets back to you, you retrieve your dice, roll them, and place them again. Euphoria breaks down those steps to bite-size increments to allow players to plan ahead and to reduce downtime when it’s not your turn, but the concept is the same. Once the game starts, it never stops for rounds or seasons or anything like that. So it’s the flow of the game of Alien Frontiers that inspired the flow of Euphoria. 9) What type of gaming experience do you hope to create for the players of Euphoria? This is probably cliché, but the word I want to use is “fun.” I always aim to create a thematic, mechanically sound game, but if the game isn’t fun, no theme or mechanic matters. I think Euphoria is a blast, and I hope backers agree. Well, I wouldn’t mind turning around this last question on you. Tell me about how your game is going and if any element of the Euphoria campaign has given you ideas for your upcoming Kickstarter. Thanks for asking – Monster Zoo is coming along really well. I’m finalizing a few more tweaks based on my last round of playtesting to streamline the game and make every round during the game count. It’s a casual deck-building game with a fun theme, so I really wanted to make every decision a fun one. I’m about to print the “final” pre-pub version and ship those out to reviewers. So a bit nervous about getting it out to the media, but the good news is that I’m happy with where the game is at. I’m also wrapping up the final pieces for the Kickstarter page for the launch in June. One of the things that has impressed me so much about the Euphoria campaign is how polished the Kickstarter page looks – you have everything covered, the review, playtesting details, box information, stretch goals, mechanics, etc. 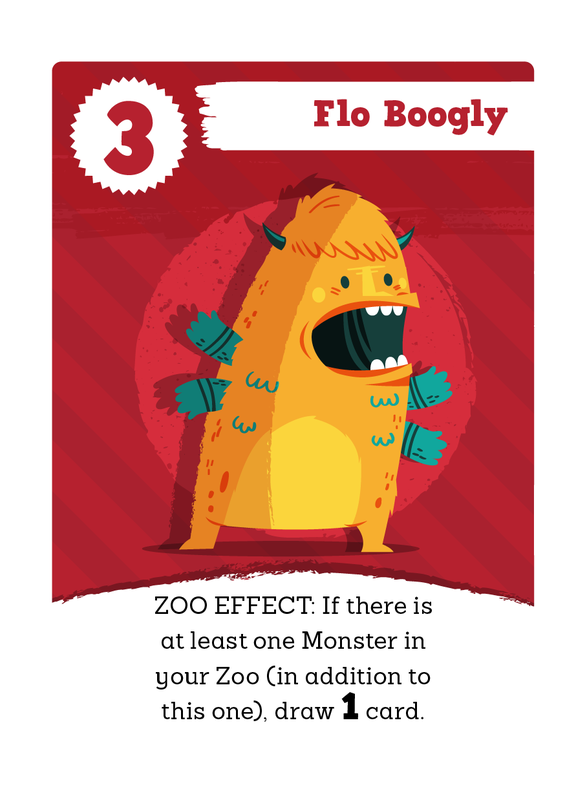 I’ll definitely be referring back to your Kickstarter page to make sure I’ve covered everything for Monster Zoo. Thanks for the interview Jamey! Make sure to check out Euphoria on Kickstarter now. This entry was posted in Game Design on May 20, 2013 by Michael N.. This week I caught up with Chris Solis, designer of Terreria Tactics – an interesting battle card game. I’ve been following Chris’s development and it’s great to see the game on Kickstarter. Let’s see what Chris has for us. I’m Chris Solis, Founder of CGC Games, life-long gamer, and creator of Terreria Tactics. I’ve been involved in organized play for tabletop as a player since middle school and I became a event host in 2006 for tabletop and video game events. Now in 2013, I’m looking to bring Terreria Tactics to life. 2) Can you describe Terreria Tactics in a few sentences? Terreria Tactics is a battle card game based on the traditional combat systems of console 90′s RPGs. Recruit your party of 4 characters and fight against another player’s party. The game is all-inclusive which means there is no trading or collecting. All the cards come in one box for you to jump straight into the game with up to 4 players (including yourself). 4 decks come pre-constructed in the box. The rest of the card pool can be found under the insert. The set-up of the game. We call it ‘Starting Party Composition’.Each player sets up their starting party in secret from their 30-card deck. That’s 4 characters, 1 Location, and 4 Items/Commands attached to your characters (leaving only 21 cards in your deck). When the game starts, the cards will be revealed over time at the player’s discretion. This is really interesting because from the same deck, you can set up different starting parties to adjust to your opponent’s strategy and play style. Of course, having more starting set-ups in your deck weakness your mid- and late-game draws so that is a choice the player needs to make. When two players understand the game well, this set-up phase reflects a lot of player psychology and meta-game understanding. It’s an extremely simple mechanic with huge depth that the game has been designed around. 4) Tell us how you came up with the theme for Terreria Tactics. Terreria Tactics is actually based on a screenplay I wrote (I have an MFA in Film). The sceenplay was inspired by the idea of a teenage village girl meeting a person from the future. What would this innocent girl think of this odd person from the future? What would the time traveler think of this simple girl or this world governed by magic? Terreria grew from that one meeting in the woods. When I started populating the world, I wanted to avoid dwarfs and elves. I’m tired of ‘em. I had this spin on dragon characters where they were bipeds, a little bigger than humans but not so much that they wouldn’t live among each other. Soon after, bird and water people started showing up on their own. 5) What’s your favorite character? My favorite character is SK the Art Historian. What make’s SK really unique is how much you can learn about your opponent’s deck if you get his effect to go off. When SK damages a player directly, that player must show you three items from his or her deck, give you one and discard the others. So, not only do you steal a card and rob your opponent of using two others, but you gain insight into how that player has constructed his deck. SK is definitely a character for a player who likes to make predictions and deductions about their opponent’s strategy. 6) What are some other games that if other players liked that game, that they would like Terreria Tactics? If you are a fan of other battle card games, you’re going to like Terreria Tactics. Magic: the Gathering, Yu-Gi-Oh!, Card Fight Vanguard, etc. I grew up with Magic: the Gathering and Yu-Gi-Oh! and I would love to still play but trading card games are expensive. This is why I wanted to design a card game in the fashion of a board game. Open the box and have fun! If you like video games like Pokemon, Final Fantasy, or Fire Emblem, you’re going to love that Terreria Tactics reminds you about those kinds of games and has beautiful art like those games as well. 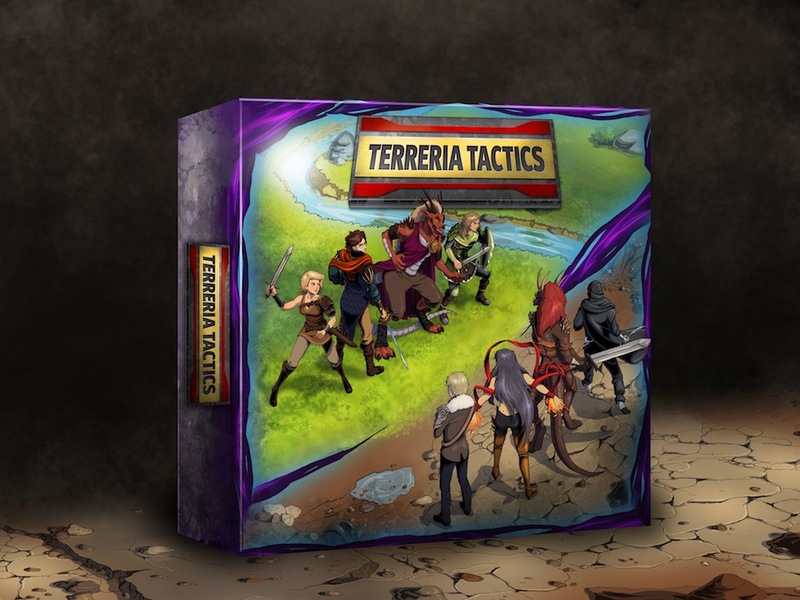 7) Terreria Tactics is your first Kickstarter board game project. What are some of the things you’ve learned from this experience that you think other Kickstarter creaters would benefit from? Launching a Kickstarter is not easy. We planned to launch a Kickstarter in January but we kept pushing it back and back because we simply we’re not ready. After tons of hours of research, we finally felt ready to launch. Pledges are also very hard to create. You have to pull back for a bit and ask yourself ‘ Would I pay for this?’. My #1 tip would be have an audience before your launch. We started our social media campaign in January and they really helped us get good Day-1 pledges. 8) What were your design inspirations for creating Terreria Tactics? My number one design inspiration is actually Starcraft. What? Starcraft? But this is a card game! Hear me out: In Starcraft each unit has a role, purpose, and function at different points in the game. I took this philosophy and made sure it would be reflected in Terreria Tactics. In card games, it’s easy for a card to simply not have a function or be an inferior version of another card. I don’t want to make cards like that. I want my cards to be as functional as units in Starcraft. There are 108 cards in TT. Every single one of them has a purpose and lends itself to optimize certain strategies. 9) What type of gaming experience do you hope to create for the players of Terreria Tactics? Two things: I want people to be able to play this game casually. I also want Terreria Tactics to offer a deeper gaming experience for those who are competitive or insightful. You can have a lot of fun picking up the preconstructed decks and duking it out. 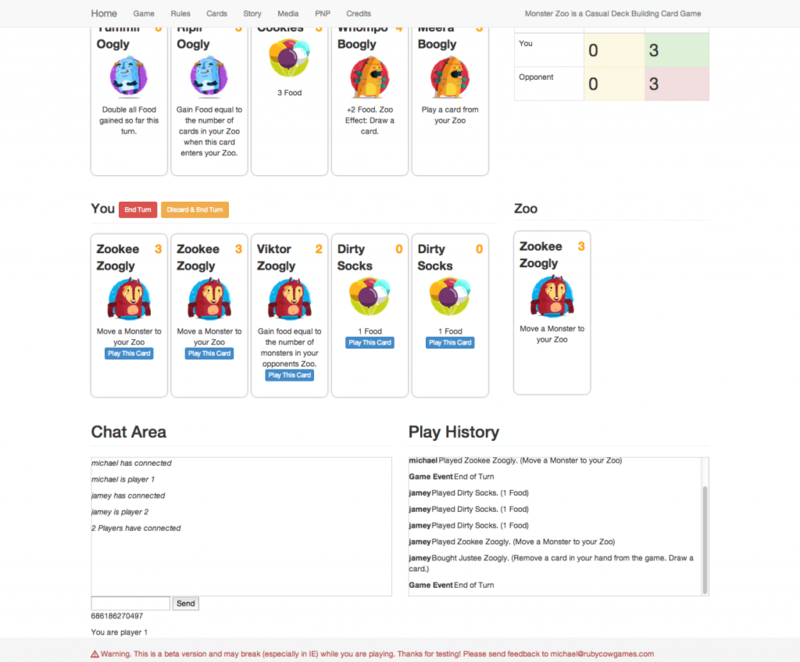 You can also have a great time studying every card to create your customized deck. The box set comes with three copies of all 108 cards (324 total), so that the competitive player can craft their perfect deck against other competitive players who own the game. It is my dream to make a game people love to play and I will do everything in my power to make that dream a reality. I want to say thank you to my early playtesters and pledgers who are really putting Terreria Tactics on track for success. I’m putting everything I have into Terreria Tactics (money, time, favors). Thanks for the interview. Thanks for the interview Chris! Make sure to check out Terreria Tactics on Kickstarter now. This entry was posted in Game Design on May 13, 2013 by Michael N.. This week I got a chance to talk with Dominique and Nathanuil DeMille, designers of Monster Moos. Let’s see what both of them had to say about their game and their ongoing Kickstarter campaign. We are Dominique and Nathanuil DeMille, the owners of Blank Wall Games Inc. Nathanuil is a mathematics instructor at the University of Arkansas and Dominique is a former retail manager turned work from home mom. We are avid gamers and love to introduce our non-board game friends to the joy of cardboard. 2) Can you describe Monster Moos in a few sentences? Monster Moos is a casual strategic game in which players take on the role of inter-dimensional cowboys trying to wrangle herds of monstrous cows. I love the sit-a-spell mechanic. I feel that a lot of games with variance, like Monster Moos, need some way for players to actively affect the variance in the game. Being able to give up your turn to sculpt a strategy makes us feel like our choices have more of an effect on the game than just blind luck. 4) Tell us how you came up with the theme for Monster Moos. The theme is all due to our son, Octavian, and his perception of animals. As we describe in our Kickstarter intro video Octavian learned his animal sounds starting with Dinosaurs. It took well over a year before he would even say dinosaur, most of the time he would just call them rawrs. When he started learning other animal sounds he figured that since dinosaurs roared so did every other animal on the planet and there was no need to learn the animals name, just call it by the sound it made. We live in Arkansas and some of the cities have grown out to encompass large estates with cattle on them or research fields from the University so it is not uncommon to see cows out in pasture land while driving around. We were driving through Fayetteville and Dominique and I were talking about another game we were working when Octavian saw some cows and got very excited and kept moo-roaring over and over. It was pretty funny and we were laughing and one of use responded that yes those were some Monster Moos out in the field. This led to a discussion about what it would be like if there were different kinds of monster cows and how you would catch them, which ultimately led to Monster Moos. 5) What’s your favorite Cow? Nathanuil is partial to the Zombie cow, but thinks the Ghost cow is pretty cute and Dominique likes the Dragon cow! they would like Monster Moos? This is an interesting question. We tried to brainstorm with a lot of players about what other games we would compare Monster Moos to but the best description a player came up with was Rummy meets Go with theme. Monster Moos is not even close to as complicated or strategic as Go, that isn’t the point of the game, but it is hard to pigeon hole it. Some people have called it a set collection game, others a trick tacking game. I would say that if you like games like Get Bit, fun or light games where the players determine the complexity, then you will like Monster Moos. 7) Monster Moos is a reboot of your first Kickstarter board game project. What are some of the things you’ve learned from that you think other Kickstarter creators would benefit from? Primarily don’t rush into it. Build up support first, try to figure out were your first 20-30% will come from and how you will dole out cool bits of information throughout the campaign. We have learned a lot and there is a lot of information out there that wasn’t when we ran our first campaign, so do your research also, but I guess that links back to the don’t rush in advice. The second thing is promote everywhere and every way you can. We always look at the other projects our backers have backed or are backing and I am amazed at how many great projects, both successful and unsuccessful, that I had never heard about. 8) What were your design inspirations for creating Monster Moos? Our design inspiration came from our desire to broaden the audience for hobby games. Right now it is our perception that the gateway to hobby gaming is pretty narrow. You basically go from Roll and Moves or Party Games straight into high strategy. That’s not to say that there aren’t good gateway games, just that there aren’t as many options as we would like. So when we set out to design Monster Moos it was with the goal of creating a game that would be accessible to anyone, even it wouldn’t appeal to anyone. From the outset we knew we wanted a game that was a race to win and not a brawl or a race to be last to lose. We also wanted player choices to be meaningful to the game’s outcome, and we wanted to reward active players, without penalizing distracted players. 9) What type of gaming experience do you hope to create for the players of Monster Moos? Our goal is to have a light fun game that will be a simultaneously accessible to different groups of people, effectively a game for anyone even if it isn’t for everyone. With our experienced gamer friends it becomes a strategic push your luck sort of game because you are trying to maximize your points per trick and leverage the action cards to make big plays. For younger gamers it is a game of matching and counting trying to make the biggest play they can at any given moment and variance plays a bigger role. For casual gamer adults it falls somewhere in between. The thing we love about the game is that all three groups can play at their level at the same time and still be competitive. I want the tricky strategic player to be able to pull off a sweet line that gets him a big score and takes him from last place to first, but I also want a child to get happy and excited when he gets lucky and gets the last tool he needed to capture a big herd that had been growing turn after turn. Monster Moos is our first game to try to take to publication, but our goal is be more than a one trick pony. We want to build a company that helps bring more people to hobby gaming and exposes more players to all of the great games out there. We love board games and feel that the shared experience they bring is vitally important when so much of our entertainment is individually consumed. It is also important to use that we make the hobby accessible to younger generations because every other form of entertainment is vying for the attention of our youth and games that parents and their kids can play together are a key component to strategy. Thanks Dominique and Nathanuil for the interview! Make sure to check out Monster Moos on Kickstarter now. This entry was posted in Game Design, Kickstarter on May 3, 2013 by Michael N..